- The fact that internal law does not impose a penalty for an act which constitutes a crime under international law does not relieve the person who committed the act from responsibility under international law. - The fact that a person who committed an act which constitutes a crime under international law acted as head of state or responsible government official does not relieve him from responsibility under international law. - The fact that a person acted pursuant to order of his government or of a superior does not relieve him from responsibility under international law, provided a moral choice was in fact possible to him. Crimes against peace: Planning, preparation, initiation or waging of a war of aggression or a war in violation of international treaties, agreements or assurances; Participation in a common plan or conspiracy for the accomplishment of any of the acts mentioned . . .
War crimes: Violations of the laws or customs of war which include, but are not limited to, murder, ill-treatment or deportation to slave-labor or for any other purpose of civilian population of or in occupied territory, murder or ill-treatment of prisoners of war, of persons on the seas, killing of hostages, plunder of public or private property, wanton destruction of cities, towns, or villages, or devastation not justified by military necessity. Crimes against humanity: Murder, extermination, enslavement, deportation and other inhuman acts done against any civilian population, or persecutions on political, racial or religious grounds, when such acts are done or such persecutions are carried on in execution of or in connection with any crime against peace or any war crime. Complicity in the commission of a crime against peace, a war crime, or a crime against humanity . . . is a crime under international law. 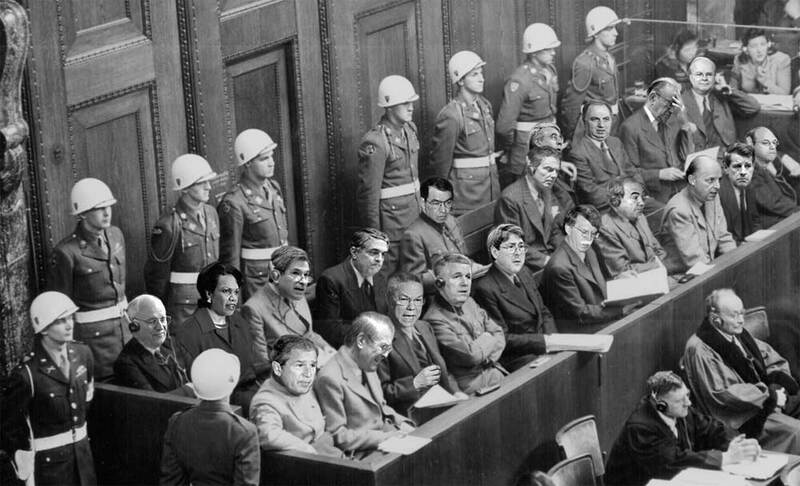 On August 19, 1947, the judges of the American military tribunal in the case of the USA vs. Karl Brandt et. al. delivered their verdict. Before announcing the guilt or innocence of each defendant, they confronted the difficult question of medical experimentation on human beings. Several German doctors had argued in their own defense that their experiments differed little from previous American or German ones. Furthermore they showed that no international law or informal statement differentiated between legal and illegal human experimentation. This argument worried Drs. Andrew Ivy and Leo Alexander, American doctors who had worked with the prosecution during the trial. On April 17, 1947, Dr. Alexander submitted a memorandum to the United States Counsel for War Crimes which outlined six points defining legitimate research. The verdict of August 19 reiterated almost all of these points in a section entitled "Permissible Medical Experiments" and revised the original six points into ten. Subsequently, the ten points became known as the "Nuremberg Code." Although the code addressed the defense arguments in general, remarkably none of the specific findings against Brandt and his codefendants mentioned the code. Thus the legal force of the document was not well established. The uncertain use of the code continued in the half century following the trial when it informed numerous international ethics statements but failed to find a place in either the American or German national law codes. Nevertheless, it remains a landmark document on medical ethics and one of the most lasting products of the "Doctors Trial." Of the ten principles which have been enumerated our judicial concern, of course, is with those requirements which are purely legal in nature — or which at least are so clearly related to matters legal that they assist us in determining criminal culpability and punishment. To go beyond that point would lead us into a field that would be beyond our sphere of competence. However, the point need not be labored. We find from the evidence that in the medical experiments which have been proved, these ten principles were much more frequently honored in their breach than in their observance. Many of the concentration camp inmates who were the victims of these atrocities were citizens of countries other than the German Reich. They were non-German nationals, including Jews and "asocial persons", both prisoners of war and civilians, who had been imprisoned and forced to submit to these tortures and barbarities without so much as a semblance of trial. In every single instance appearing in the record, subjects were used who did not consent to the experiments; indeed, as to some of the experiments, it is not even contended by the defendants that the subjects occupied the status of volunteers. In no case was the experimental subject at liberty of his own free choice to withdraw from any experiment. In many cases experiments were performed by unqualified persons; were conducted at random for no adequate scientific reason, and under revolting physical conditions. All of the experiments were conducted with unnecessary suffering and injury and but very little, if any, precautions were taken to protect or safeguard the human subjects from the possibilities of injury, disability, or death. In every one of the experiments the subjects experienced extreme pain or torture, and in most of them they suffered permanent injury, mutilation, or death, either as a direct result of the experiments or because of lack of adequate follow-up care. Under the Anglo-Saxon system of jurisprudence every defendant in a criminal case is presumed to be innocent of an offense charged until the prosecution, by competent, credible proof, has shown his guilt to the exclusion of every reasonable doubt. And this presumption abides with the defendant through each stage of his trial until such degree of proof has been adduced. A "reasonable doubt" as the name implies is one conformable to reason — a doubt which a reasonable man would entertain. Stated differently, it is that state of a case which, after a full and complete comparison and consideration of all the evidence, would leave an unbiased, unprejudiced, reflective person, charged with the responsibility for decision, in the state of mind that he could not say that he felt an abiding conviction amounting to a moral certainty of the truth of the charge.